Not sure what insulin pen you are using? Designed to make life with diabetes a little bit easier. Timesulin automatically tracks the time since your last injection. Replace your old cap with Timesulin and it will immediately start counting the seconds, starting at one second (00:01) and counting up to an hour. After an hour, the timer mode will switch from MM:SS to HH:MM. If you wish to check how much insulin is left in your pen, remove Timesulin for less than 8 seconds and the timer will not reset. Lifespan of a Timesulin is 12 months, the screen will start fading and then go blank. We will check up with you during your first months of Timesulin use to make sure you are satisfied (we have 30-day money-back guarantee if you are not happy) and also remind you when it’s time to replace your Timesulin unit. Such a great and simple product! All I can say brilliant!!! Brilliant!!! Brilliant!!! Buy one it may save your life ! Brilliant product. Shame you cant change the batteries but it’s less than 1 pence/day for not double injecting myself, definitely worth it! Thanks for your comment. The lifespan of Timesulin is 12 months, so the costs of Timesulin is 0.07 pence / day. The reason why Timesulin comes with a built in battery is to keep the design simple, no extra bulk when attached to your insulin pen. We recently launched a Timesulin model for the Novo Nordisk FlexTouch pen. 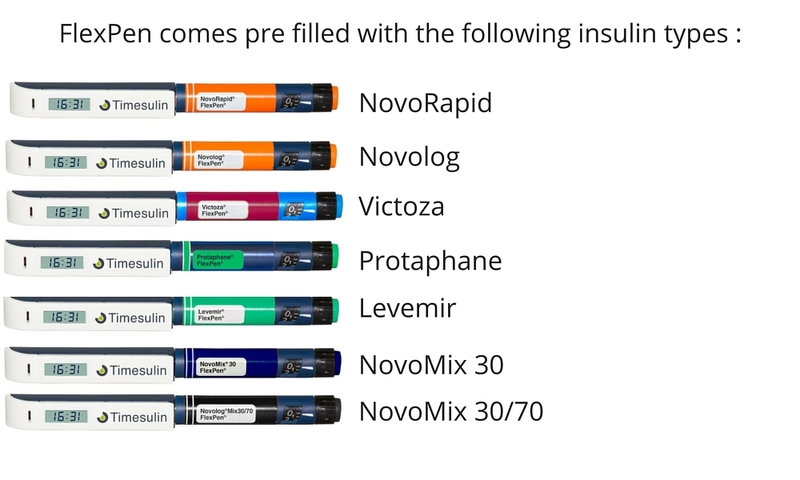 For now we remain focused on the pre-filled insulin pens. Good service – excellent product. A nurse recommended me Timesulin and I have been using the device for 2 weeks now – thanks!! Perfect Gadget to help me remember my injections. I absolutely love this product. All my worries about whether I did an injection have disappeared and the service I recieved on the phone was also excellent. I’m so impressed I’m going to take the product to my consultant on my next visit and recommend. Thank you. What a relief!!!! Hi, It states on your website that the timeinsulin was located locally in Australia, with ” CLosing the Loop”, but this website comes up in error, so just wondering what happened here??? You can order Timesulin directly from our website – and it will be sent to you in Australia via our partner in Sydney.